Alternatively titled: I tested 8 natural deodorants so you didn’t have to. This is the attitude I assumed when my editor asked me to test and review natural deodorant. Unlike conventional deodorants, natural deodorants, as the name suggests, are made with natural ingredients in place of potentially toxic man-made chemicals. Natural deodorants are generally devoid of parabens, which preserve the shelf-life of the products and prevent mold, but leach into aquatic ecosystems and may (though the evidence is conflicting) disrupt hormone function. Natural deodorants also nix antiperspirant aluminum. 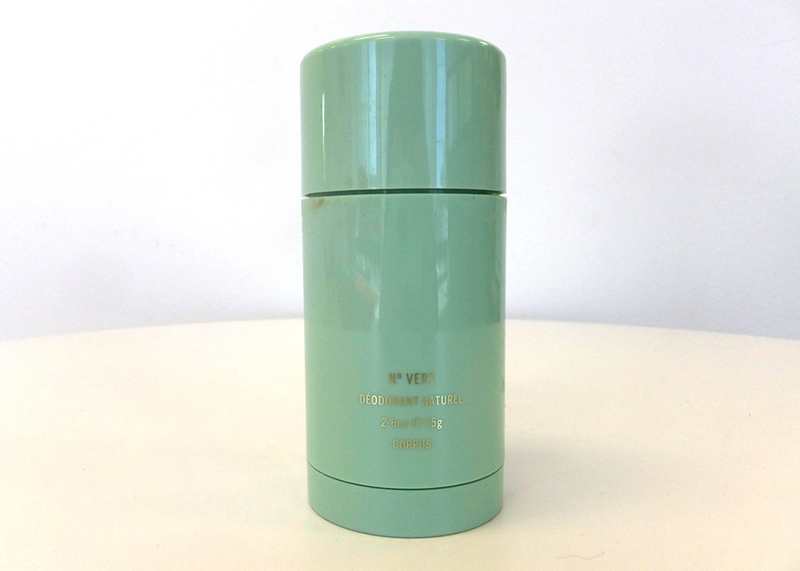 Antiperspirants temporarily clogging the pores in your arms to prevent sweat from escaping in the first place. Since the 1960s, parts of the public has linked aluminum in deodorant to several degenerative and chronic diseases, including breast cancer and Alzheimer’s, but scientific research generally does not support these claims. Nevertheless, sweating is a normal body function that is essential for regulating temperature and ridding the body of toxins. A 2016 study also showed that people who use antiperspirants have fewer pathogen-fighting bacteria in their armpits. Natural deodorant is not perfect, either. A 2006 study showed that allergens present in botanical ingredients used in personal care products cause significant and often under-reported cases of contact dermatitis, an itchy red rash caused by contact with an allergen. Plus, a subpar natural deodorant can leave you a little slick and smelly. Even in light of the fuzzy scientific speculation, I have been using natural deodorants for almost a decade now in my attempt to be more conscious about what I put on my body. I can tell you from experience that there are a wide variety of natural deodorants on the market with different compositions, price points and … let’s say, levels of effectiveness. 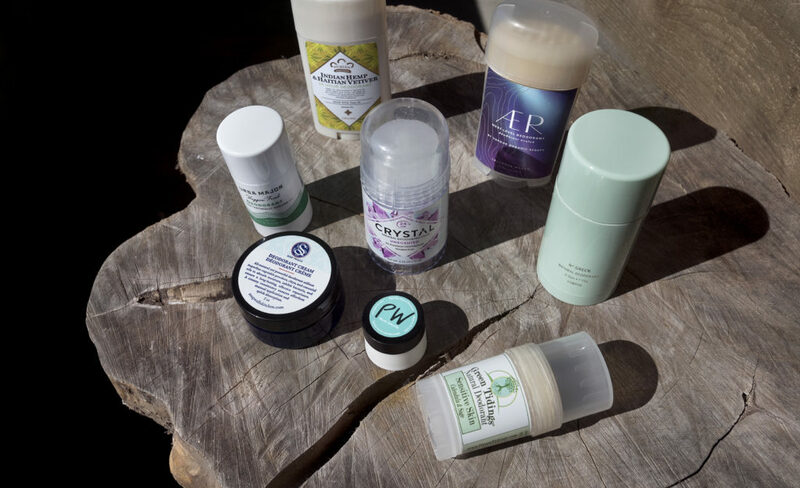 I tested 8 natural deodorants, slathering each one generously on my pits for the duration of one week (if I could stand it…read on). I went to work, exercised at the gym, wore black t-shirts and generally continued about my daily life. Here is my ranking and what I thought. Nubian Heritage’s natural deodorant is made from pure non-GMO glycols derived from corn and does not contain aluminum, propylene glycol, parabens, triclosan or silicones. It also has a spectacular spectrum of scents, from Coconut and Papaya, to Abyssinian Oil and Chia Seed. 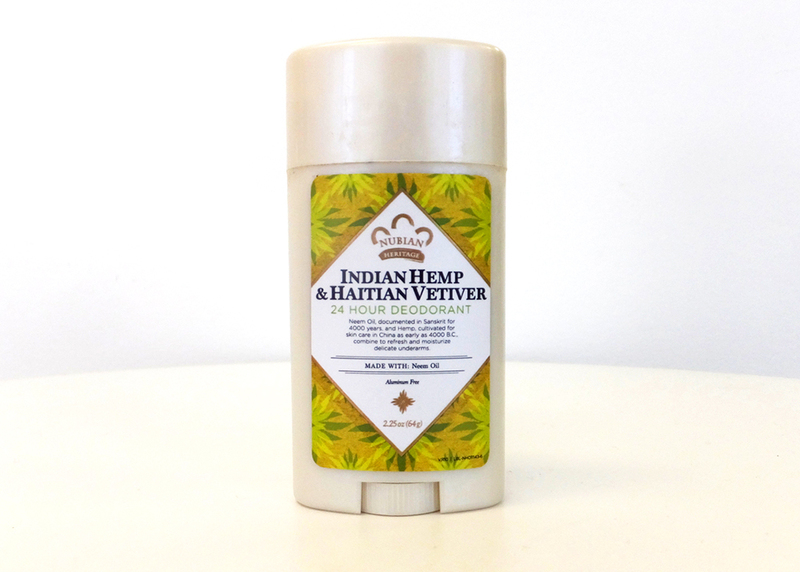 I chose Indian Hemp & Haitian Vetiver because hemp fascinates me and my quick sniff test revealed it was not too overwhelming or fruity (apparently, it is their unisex scent). Of all the sticks I tested, this one looks the most like a conventional stick of deodorant, which I imagine makes it less intimidating for those wetting their feet in the natural deodorant pool for the first time. It glides on nicely (again, just like a conventional deodorant) and there were minimal white streaks. It held up fantastically at the gym, with no unpleasant odors and only slightly more wetness than more expensive brands like Ursa Major. After the product test ended, this was the product I most frequently used for both effectiveness and price. This gluten-free, cruelty-free product devoid of petrochemicals, parabens, synthetic fragrance or color, glycols, silicones is clearly the creme de la creme of natural deodorant. At its price point, it probably should be. The eucalyptus and mint scent is delightfully refreshing, and the moisturizing formula is actually (and I never thought I would say this about deodorant) a joy to apply. It left absolutely no white streaks, and keeps sweat smells at bay even in the most trying circumstances (like hiking to work under many layers of synthetic fabrics during a snowstorm). The cost is slightly prohibitive, but if you can afford it, I highly recommend it. Aesthetically, I think this vegan, aluminum-free, paraben-free, baking soda-free deodorant made in the USA is the best looking deodorant out of the bunch. The sleek, cylindrical mint-colored case with gold lettering looks like an eco-friendly Chanel product, and the bergamot, pink lemon, orange blossom and cardamom formula is exactly what I think kind, rich people smell like. The deodorant didn’t turn me into one of those people, but it was overall a pretty good product. The application experience is pleasant given the ergonomic packaging, but it is a little chalkier than I expected. It left some white streaks on the inside of my black shirt, but they easily rubbed out. I had a distinct, herbaceous, but not entirely unpleasant smell after working out. The price points looks intimidating, but consider the weight; per ounce, it is less expensive than the Ursa Major. The cruelty-free, baking soda-based product (made with renewable energy and delivered in a recycled fiber box printed with vegetable dye, which is nice) is the only gel-to-powder deodorant out of the bunch. The applicator twists the product up through a perforated plastic top, kind of like prescription deodorant. They say a little goes a long way, but I didn’t really have a good sense of how much I should put on — one cranks or two? — and noticed the supply in the canister quickly dissipating over the course of a week. Applying it is a little awkward because of the plastic top is chilly and the formula is a little chalky. It does not leave white marks on your clothes, but it leaves sort of dry chunks on your armpits that are a little unsightly. In general, it is pretty effective, but I still experienced some wetness throughout the day. I tried the Lavender Myrrh scent (there are two other scents: Ginger Grapefruit and Palo Santo Blood Orange). The scent was one of my favorites of the bunch, but I do not think it is worth it for the price. 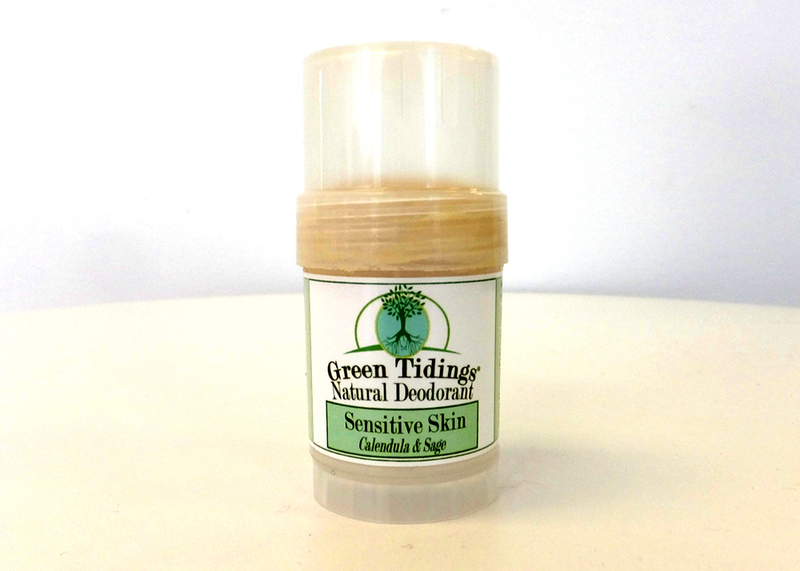 Green Tidings boasts deodorant that is, among other eco-bonafides, vegan, gluten-free, non-toxic, aluminum-free, paraben-free, pthalate-free and cruelty-free, all prepared in a solar-powered facility in Southern California and packaged in a recyclable tube. There are a wide variety of available scents, from lavender to orange vanilla. I tested the Sensitive Skin Calendula & Sage stick, hoping to avoid my own case of contact dermatitis. The deodorant is tacky and uncomfortable to apply, but once it is on, my black t-shirt remained unscathed by unsightly white marks. The first day, there was a little discomfort as my highly sensitive skin adjusted to its new salve, but that went away. There are a number of warnings on the tube about reactions to skin, so I can only imagine this is a common experience. My deskmates had no complaints about my daily scent, though I felt like I smelled a little like a leg of lamb after working out at the gym, but may have just been my otherwise delicious mental association of sage with lamb. It reacted poorly and pungently with some of my sweaters, but I think that had more to do with the presence of artificial fibers than anything else (I have grown increasingly aware of the environmental cost of fashion as of late). This tub-based deodorants is made with superfine vegetable powders, clay and essential oils, so is slightly creamier than the charcoal, but it is recommended that you “stir” it with your finger, which frankly, I did not like at all. Again, I am not sure if I was putting on enough, it inevitably rubbed off all over my clothes and I sincerely do not enjoy applying deodorant with my fingers no matter how creamy it is, but there was a more neutral, slightly citrusy and less noticeable smell with this cream and it held up while I was working out. The tub of cream almost looks like an edible spread, which makes sense, because it is made with organic, food grade ingredients. I wonder how it would taste spread on toast instead of my armpits. Given that it also gave me a rash, I might prefer it that way. This is second of two natural deodorants that I tested that came in a tub that you have to apply this deodorant with your fingers. I personally cannot stand the tactile application experience — particularly with this deodorant which is slightly chalky and left an unpleasant residue on my fingers that I accidentally wiped on my pants more than once — but it also comes in a stick form. Having never applied deodorant with my fingers before this test, I also was not sure how much to put on, and given the way that I ripened over the course of the day, I think I consistently undershot it. The deodorant is made with activated charcoal, which is purported to neutralize odor and absorb moisture, and has a nice, neutral smell. However, I experienced quite a bit of wetness after a while, some noticeable body odor after exercising and developed a slight rash over the course of the week. Perhaps I lack the magic touch. 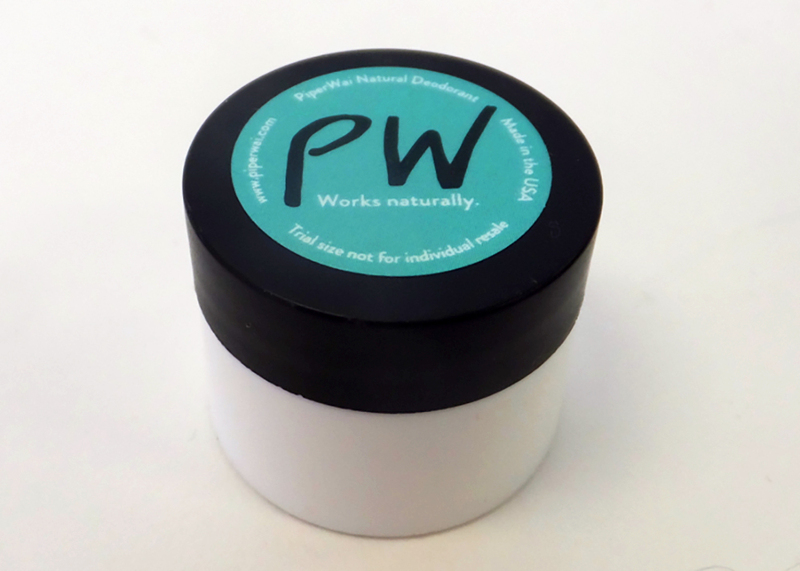 Let’s start with the positive: this pure mineral salt deodorant is vegan and cruelty-free, with no aluminum, parabens, phthalates or artificial fragrance. Now, the rub: this deodorant did not work for me at all. The “stick” is a solid block of salt that you have to wet before you apply, which is extremely uncomfortable and left me shaking my armpits like a hairless dog. At first blush, it seemed to be working, but after a few hours of work (sitting at my desk, just marinating in my own juices), the deodorizing properties started dissipating and…well, folks, I stank. I stayed surprisingly dry, but the smell was really too much. We needn’t discuss my experience at the gym. It left no white streaks and did not give me a rash, but then again, neither does wearing no deodorant at all, which frankly, I might as well have been. I had to ditch testing this one after just a few days for the sake of my deskmate (you’re welcome, Aislinn). As my precious pits recover from weeks of testing natural deodorants, it is worth noting that the results will be skewed to favor my body chemistry. Not all of them are winners, certainly some of these natural products made me feel Whitman-esque and divine. Great article! But missing Primal Pit Paste 🙂 All-natural, USDA certified organic, cruelty-free, paraben-free, synthetic fragrance free, and comes in FIVE different formulations (baking soda, zinc, magnesium, charcoal and witch hazel) and NINE different scents to suit all body chemistries. You’d love our new zinc sticks! Let me know if you’d be interested in offering your readers a special introductory discount code. Hi Katie! I reached out to Primal Pit Paste for the article and never heard back, but I will definitely keep you in mind for future product tests.